I hope everyone is having a great summer thus far. It’s time for a Giveaway! Yes free stuff alert, because I just launched a GoodReads.com giveaway for The Story Solution. 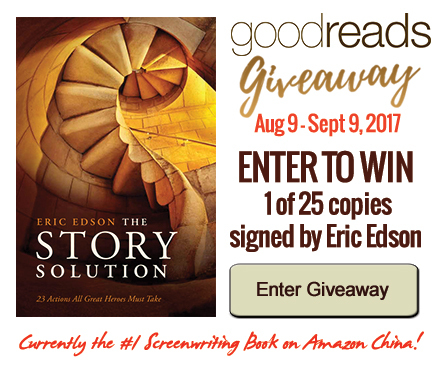 You can go for one of 25 signed copies of The Story Solution being offered by entering the giveaway for free here! Must enter between Aug 9th – Sept. 9th. If you’re interested in reading a sample, just click here. I am asking for an honest review in exchange for entering the giveaway, because on the internet it’s all about reviews! So… I must step out of my comfort zone here to ask all you good folks to leave a review on either Amazon or GoodReads or both; every one helps! Many of you have been fantastic in showing your support and from my heart, It’s truly appreciated. The book has really taken off in China, reaching the #1 slot on Amazon China for “Film and TV” books, and also hitting #1 in the categories of “Animation” and “Graphic Novels”. 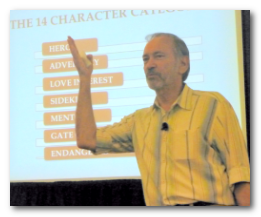 As a reminder, I recently completed a series of video interviews for the online screenwriting community Film Courage. Also, there’s another terrific series of webinars coming up soon from my friends and colleagues, the professional consultants and educators at eiACE that you should check out. Hope everyone is in the mood to write! Feel free to look me up on Facebook to say hello! I can’t always be speedy about it, but I aim to answer all messages that come my way! About The Story Solution: Eric Edson’s The Story Solution provides concrete insights for those interested in writing a screenplay. Regarded as one of the best books on screenwriting, The Story Solution is currently #1 in its category on China Amazon. Visit the website at https://www.thestorysolution.com to download a complimentary book chapter and to see video and hear audio clips about creating characters. “Like” the Facebook page to receive tips on writing a movie script and scriptwriting.